22 Apr 19: The 2m Bank Holiday Refresher (FISTS CW Club Europe) starts with Monday 22nd & Tuesday 30th April 19:00-21:00 UTC (with 4 further sessions in May). RST, name, QTH, member number (if available). Recommended frequencies 144.025 - 144.100 with centre of activity 144.052. QSO points are as per the Ladder but also multipliers apply. If you use FISTS Log Converter, please install version 3.7.2 or later. Mon 22 April 19:00 - 21:00 (Easter Bank Holiday). Tue 30 April 19:00 - 21:00. Wed 08 May 19:00 - 21:00. Thu 16 May 19:00 - 21:00. Sat 25 May 14:00 - 16:00. Mon 27 May 10:00 - 12:00 (Spring Bank Holiday). Ladder Sunday 14 April 14:00-16:00 & 18:00-20:00 UTC. 2m Bank Holiday Refresher Monday 22nd & Tuesday 30th April 19:00-21:00 UTC (& 4 May sessions). Winter Sports (FISTS CW Club Europe) no later than 7 April. Ladder (FISTS CW Club Europe) no later than 7 April. Snakes & Ladders (EuCW) no later than 7 April. *** If you had Ladder QSOs on any or all of 24 February, 10 March, 24 March, PLEASE do send in a Winter Sports log. Ladder QSOs can be used towards Winter Sports! At a bare minimum, one QSO with a member will count towards the Cross Country event, and your QSOs may qualify for more points in other Winter Sports events. See the Winter Sports rules for more information. 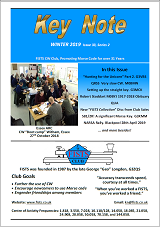 25 Mar 19: The Winter 2019 Key Note is now available to all current FISTS CW Club members. Hunting for the Unicorn Part 2. Setting up the straight key. Robert Stoddart M0BYJ 1917-2018 Obituary. S81/2R! A significant Morse Key. NARSA Rally. Blackpool 28th April 2019. Ladder Sunday 24 March 14:00-16:00 & 18:00-20:00 UTC. NOTE: Ladder QSOs can also be used to claim Winter Sports points. QSOs are friendly and conversational. Submitting logs is very much appreciated but not essential. Members from all FISTS Chapters are encouraged to join in; QSOs do not have to be with FISTS members. Winter Sports continues until 31 March 23:59 UTC. This is a set of five varied events, each of which has QRP and Open sections: Ski Jump, Alpine Skiing, Cross Country Skiing, Bobsleigh, & Speed Skating. Operation is on 160m, 80m, 40m, 20m, 15m, & 10m. Wrap up well and have your Morse key polished and ready! 16 Mar 19: The FISTS CW Club Europe BrassPounder March 2019 newsletter has just been published by David G4YVM, Activities Manager. This edition includes details of the February 2019 Ladder results and information about the upcoming activities in April and May. Ladder Sunday 10 March 14:00-16:00 & 18:00-20:00 UTC. Ladder (FISTS CW Club Europe) no later than 7 March. Snakes & Ladders (EuCW) no later than 7 March. Winter Sports (FISTS CW Club Europe) logs are not due until 07 April; **HOWEVER** note that 27 February Ladder QSOs can be used towards Winter Sports! At a bare minimum, one QSO with a member will count towards the Cross Country event, and your QSOs may qualify for more points in other Winter Sports events. In all the activities, if you only had one QSO or feel that you won't be highly placed, please do send in logs to encourage others to join in. Ladder Sunday 24 February 14:00-16:00 & 18:00-20:00 UTC. Ladder Sunday 10 February 14:00-16:00 & 18:00-20:00 UTC. 09 Feb 19: The FISTS CW Club Europe BrassPounder February 2019 newsletter has just been published by David G4YVM, Activities Manager. This edition includes details of the January 2019 Ladder results. Ladder (FISTS CW Club Europe) no later than 7 February. Snakes & Ladders (EuCW) no later than 7 February. Winter Sports (FISTS CW Club Europe) logs are not due until 07 April **HOWEVER** note that 27 January Ladder QSOs can be used towards Winter Sports! At a bare minimum, one QSO with a member will count towards the Cross Country event, and your QSOs may qualify for more points in the Winter Sports events. Ladder Sunday 27 January 14:00-16:00 & 18:00-20:00 UTC. 23 Jan 19: The FISTS CW Club Europe BrassPounder January 2019 newsletter has just been published by David G4YVM, Activities Manager. This edition includes details of the 2018 Ladder and Straight Key Week results. 14 Jan 19: The latest version, 3.6.1, of the free FISTS Log Converter program for Windows is now available. This version adds support for the Winter Sports 2019 on-air activity (FISTS CW Club Europe). The program is available from the download web page. Many thanks to the testers: Alex PA1FOX, Michael G0POT, Peter G4LHI, and Richard G0ILN. 13 Jan 19: The FISTS CW Club Europe BrassPounder December 2018 newsletter has just been published by David G4YVM, Activities Manager. This edition includes details of the November 2018 Ladder results and the rules for the 2019 Winter Sports. Ladder Sunday 13 January 14:00-16:00 & 18:00-20:00 UTC. Winter Sports runs from 19 January to 31 March inclusive. This is a set of five varied events that have QRP and Open sections: Ski Jump, Alpine Skiing, Cross Country Skiing, Bobsleigh, & Speed Skating.